The Premier’s Active April (PAA) campaign is part of the Victorian Government’s commitment to promote healthy, active lifestyles and have Victorians physically active. The campaign runs for the entire month of April and offers prizes to Victorian schools, workplaces and individuals for being more active. The Victorian government wants us to inspire our fellow Victorians to dance, and by dancing to increase their physical activity. DSV is advertising through the vibrant PAA website – free ‘try out’ dance lessons – to the public. This is for any DSV member studios that want to join the campaign. The five free Ballroom, New Vogue and Latin classes are offered in group classes, which will give a shared experience. Group classes also provide the potential to make new friends. Over 40 dance schools and studios across Victoria are participating in the PAA. Now get them as many new dancers as possible! All the participating dance schools and studios are Registered Training Facilities (RTFs) with DanceSport Australia. This means they are recognised by our sport's governing body and abide by a Professional Code of Conduct. Geoff Vine, Chairman of DanceSport Australia’s Marketing and Communication Commission, says, "We had had great support last year and look forward to more RTFs getting value from this program. This is great timing for our industry and can ride on the back of the ‘Dancing With The Stars’ TV show. Let’s pull together and provide a compelling offer for the benefit of Victorians. Giving five free dance classes is a very generous offer." How great is that! Even more reason to promote PAA! H2: DanceSport is a Major Partner for PAA! 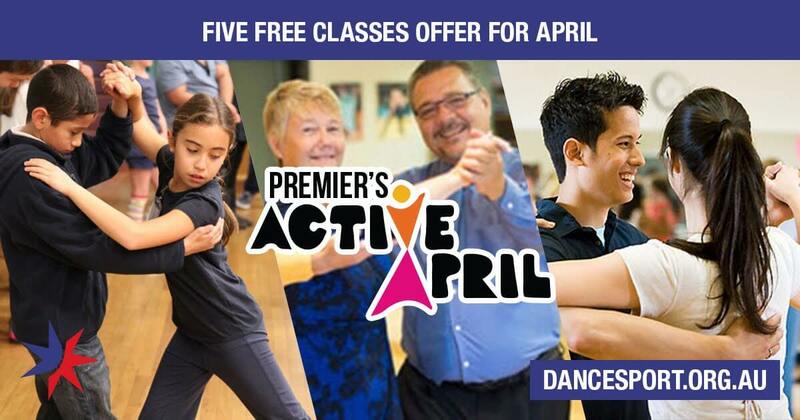 The generous offer and industry support put together by DanceSport Victoria has given us ‘Major Partner’ status in the Premier’s Active April campaign. Any queries contact Geoff Vine, Marketing Exec at marketing@dancesport.org.au or 0408189295.